Buy 288 printed Callaway CXR Golf Balls and receive a FREE Callaway Clubhouse Duffle Bag- Small + Callaway 68" Double Canopy Umbrella + Callaway Clubhouse Shoe Bag! 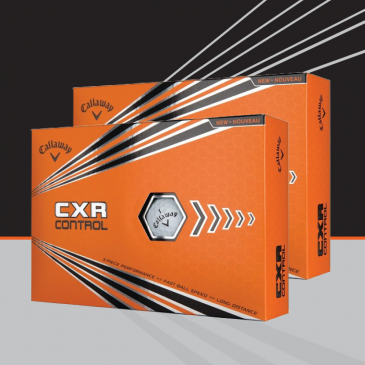 The CXR Control is a 3-piece performance ball that combines fast ball speed and long distance with softer feel and greenside control to help you hit pinpoint approach shots for lower scores. >> HEX Aerodynamics - Reduces drag and produces a more penetrating ball flight for more distance. >> Lonomer Cover - Promotes low driver spin for long drives and is built to provide max durability.